Infographics commonly used to display a lot of information in a single, visually-appealing graphic. Financial infographics allow to visualize the dynamic of commercial and financial data, and illustrate financial success of the commercial organization for a certain period. 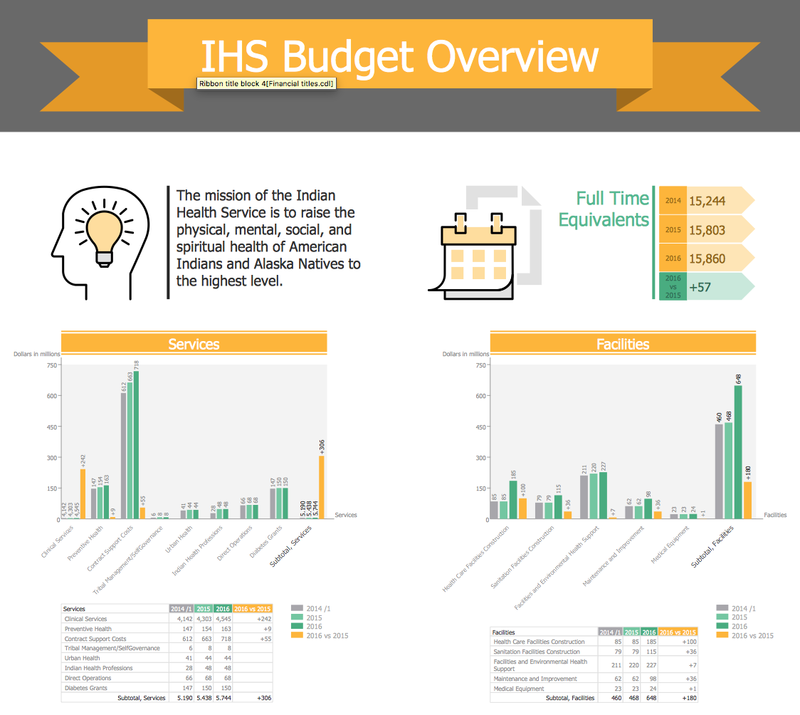 A financial report created using financial infographics containing graphs, charts, and illustrations of different types the most clearly reflects financial result of the company and allows the stakeholders to assess instantly the degree of its profitability. Ability to create Financial Infographics in ConceptDraw DIAGRAM is contained in the Financial Infographics solution. The Financial Infographics solution is a paid add-on to ConceptDraw DIAGRAM that provides users with a powerful and easy to use Infographics tool for an economical price. The Financial Infographics solution is perfect for visual communication and illustration the documents, reports and presentations about finances: money, accounting, banks, taxes, expenses and incomes, savings, investments, currencies, budget and more. Reveal the Financial solution on the solutions panel. Open needed libraries by clicking the proper previews. Use the data table to plot the chart. You should previously activate it by clicking the Hide Table option in the Action button menu. Then, enter data into the table: select a proper cell and type the value. Next, add a text to infographics. Just select an object and start typing. Finally, you can export your drawing as Adobe PDF documents, Web pages or graphic images using Export options from the File menu. Accelerate your success in visualization of financial data, statistics, and reports. Vivify commercial presentations and analytic documents with modern and convenient infographics drawing tools of Financial Infographics solution.